Although the paleo lifestyle allows for almost all vegetables, fresh corn unfortunately falls in the no-no column. Considered a grain, it’s also high in sugar — being the base of high fructose corn syrup, that’s a duh, but the corn for syrup is a different strain than what you eat fresh. But I cheat sometimes. 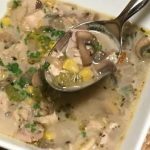 Like in this mushroom, chicken, corn chowder. That said, you can certainly replace with the corn with another vegetable of choice, like kale, peas, or spinach. It’s nearing the end of tomato season here in California and I’m always sad when this time comes. Soon, I won’t be able to simply walk outside, pick a plump favorite off the bush and maw on it with fervor. My husband professes that I have a freakish love for these nightshades and I unabashedly admit it — they are a perfect fruit that acts like a vegetable. Tomato sauce, Caprese salad, simply sliced with salt/pepper or in these recipes featuring tomatoes — I wallow in the beautiful yellow, red and green orbs all summer. I’ve been developing this paleo friendly gazpacho soup lately since this year’s massive crop has lent itself to tons of experimentation. The ingredient list might look long but this uncooked blender soup comes together in about 15-20 minutes. How easy is that? Add cooked shrimp to make it a complete meal. The packages of beef jerky at the gas station make every fiber of my body shudder. I can’t get past the thought of consuming any part of that slimy, salty, chewy “beef product”… the expiration date and unpronounceable ingredient list reveal a recipe for a disgusting, bloated disaster. But too often it’s the only quick protein to be had in a convenience store when on the road, so I reach for nuts, which are a poor substitute when craving meat. I don’t have to worry about that anymore. I discovered fresh fennel as an adult, after getting over my aversion to anything licorice. I still can’t eat red or black licorice candy but have fallen head over for this anise-scented, bulbous vegetable. I also make salads with it, tossing in whole grain mustard and rice vinegar but this spicy, garlic-y shrimp and fennel recipe is go-to weeknight deliciousness for us. Since fennel can be awkward to slice, cut the bulb in half and place the flat part on the cutting board for leverage. From there, a really sharp 8-inch chef’s knife will help a lot. So simple, you can have dinner on the table in less than 30 minutes. Buy peeled and deveined shrimp and it will save even more time. Most black bean soups start with dried beans, but in this one I use canned. Why? It’s easier and faster. And almost as cheap. Just be sure to wash them to remove the salt which can throw off your soup flavors. This recipe is also designed to be the main course with a simple salad as a side dish. The New Year is well underway. I don’t know about you, but for me, the dawning of a brand new calendar encourages me to freshen things up in the kitchen. Gone are the last few months of heavy, overindulgence (thank goodness! ), and in comes lightened flavors to get our bodies moving for the new adventures ahead. Like this recipe for Edamame Salad with Avocado and Grapefruit. A hearty, one-dish winter meal that provides tons of veggies and satisfaction. Pair them with an inexpensive sparking wine like Italian Prosecco or Spanish Cava and you’ve got a meal made for any weeknight.